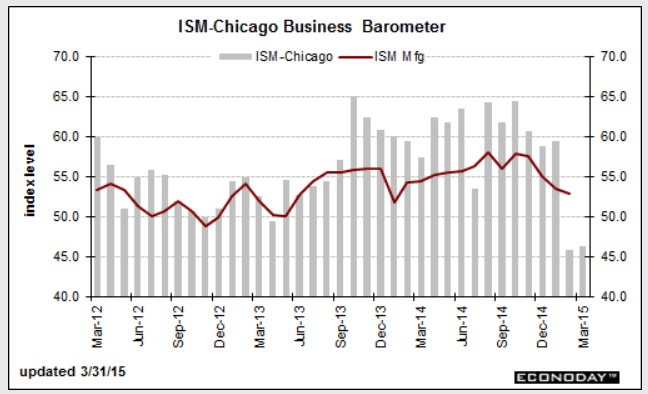 Economists expected a rebound in the Chicago PMI index this month following its collapse last month. Alas, once again the weather was much worse in Chicago than economists thought. 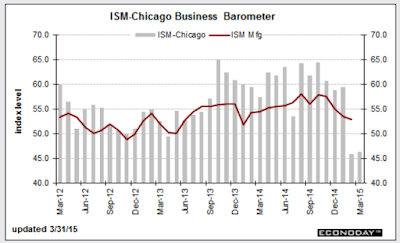 "Companies sampled in the Chicago PMI report continue to report a lull in activity, at a sub-50 March index of 46.3 following 45.8 in February. On a quarterly basis, the index averaged only 50.5 in the first quarter, down steeply from 61.3 in the fourth quarter for the weakest reading since the third quarter of 2009. Respondents are citing bad weather and fallout from the West Coast port slowdown as temporary negatives, and they see orders picking up during the second quarter." That the Chicago PMI index remained in contraction for the second month at 46.3 while economists expected a rebound into positive territory proves once again how difficult it is for economists to predict the weather in Chicago for February, even though it's now March. Don't worry, economists tell us this unfortunate string of bad weather is "temporary" and will improve in the second quarter. On the dark side, I fail to see how economists can predict the weather in advance when they cannot do so in arrears.